Redwood Plastics is happy to announce a new product offering* under our HDPE line: Redco Woodgrain HDPE. This attractive product is durable, UV-stable, tough, and easy to work with saws, drills, lathes, and other tools that would regularly be used for wood products. This product is optimized for outdoor use and will never require repainting. Highly weather-resistant, with fade resistant colorant (impregnated throughout the entire sheet), this product can take the impact of everyday life and will outlast wood. Redco Woodgrain is currently available in a single sheet size and a single thickness: 4′ x 8′ x 3/4″ thick. Available colors are espresso brown, tan, and black. Custom thicknesses are available but only with a 5,000 lbs or greater minimum order. The attractive faux wood surface makes the product excellent for applications such as outdoor kitchens, tables, marine furniture, playground equipment, decking, or anything else you feel would be suited to a strong, weather-resistant, attractive replacement to wood. This is a premium product and it will not be competitive on price alone when compared to the cost of wood. However, for the individual or organization that is looking for a product with a low life-cycle cost requiring very little maintenance, repainting, cleaning, or other labor, and wants a premium product then Redco Woodgrain HDPE offers an excellent solution. To inquire about pricing or if you have questions on this product please contact us. *Please note the product is not currently stocked at our locations and will need to be brought in as required for orders. Typical lead time to land the product is 2 weeks. The minimum order is a single full sheet, it is not sold in smaller sizes or partials. Today we’re highlighting a recent application by our Spokane branch. Recently we were contacted by Dutch Bros. Coffee who has a location at Avista Stadium: home of the Spokane Indians baseball team. Dutch was looking for a clear plastic to protect their storefront signs and graphics. General-purpose polycarbonate was chosen for its excellent impact strength which will prevent breakage from anything from vandalism to accidental bumps. In addition, the polycarbonate is much more forgiving with drilling than acrylic – and several screws were tapped into the sheet. The polycarbonate was 3/16″ thick for this application. The picture below shows the completed application. For help with your polycarbonate needs please get in touch with us. Recently Terrapin Brewing Co (www.terrapinbeer.com) approached us with an interesting application. They wanted to create a plastic table surface for use at their brewery but this offered some unique challenges. For one, the tables were outside which meant that a UV-stable plastic was in order. Secondly, a variety of properties were important: wear, impact, anti-slip and non-fading color would be desirable. But most importantly the color had to be green and a green that was fairly close to the branding of Terrapin Brewing Co. 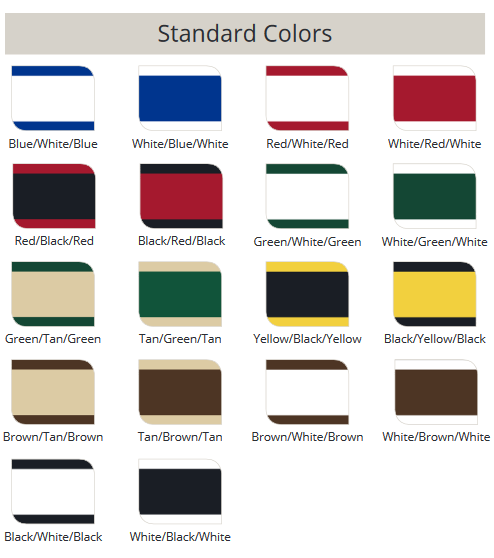 This is difficult in the world of industrial plastics where custom colors can mean extra costs, long lead times, and minimum order sizes. In addition, an industrial plastic such as UHMW would be overkill for this application and would even have some undesirable characteristics, such as being very slick. But our representative working on the application made an intuitive leap. We had access to a specialized HDPE material Redco “Play” board designed for playgrounds. In our world of sawmills, mines, and heavy construction this isn’t something we focus on! Nevertheless, Redco Play satisfied all the requirements of the application: it was green, UV-stable, impact-resistant, wear-resistant and had an “orange peel” textured surface so glasses wouldn’t slide around. They were supplied pre-cut into 24″ x 24″ x 1/2″ (thick) squares with a minimum order of 16. Terrapin quickly installed these and you can see a picture they sent us below. They have said they are very satisfied with the material and this application.